Go beyond boundaries, interact with new worlds and experiences incaptivating VR. The YouVisit VR app delivers the best the universehas to offer, straight to your phone in captivating and interactiveVirtual Reality.YouVisit VR puts you in control. Chart your owncourse through the story, interact within scenes, and explorebeyond what’s possible.You will:• Pump your adrenaline inexhilarating adventures.• Immerse yourself in experiential travel.•Ease your mind with relaxing experiences.• Expand your knowledgewith experiential learning.• Escape into the world of interactivegames.Check back often. New content added regularly.Tips forwatching VR:• Select the type of experience based on the categorytags• For an optimal experience, A fast WiFi connection isrecommended• Place your phone in a VR headset. Google Cardboard isan affordable VR headset (learn more at g.co/cardboard). • Audio isimportant for a more immersive experience, so have your headphonesready. • No headset? No problem. In the app, switch to Phone Modeand use your finger to pan around.- Start experiencing thetransformative power of Interactive Virtual Reality (VR). - Don'tforget to look around!Must see VR experiences:• Exotic Kingdom(Hang out with Lemurs, Elephants, and Tigers)• Tomorrow World: AllAccess (Feel the Music, Backstage)• High Altitude: Hikes Around theWorld (Hike Yosemite, Italian Alps, and Cape Town)• Hover:Helicopter Rides (NYC, Houston, Grand Cayman Island)• NYC: The Citythat Never Sleeps (From Skyline to Coney Island)• Puppy Love (Playwith Puppies)• Front and Center: Best DJ's in the World (Armin VB,Ultra Music Festival)• A Tour of Paris (Visit Eiffel Tower, Arc deTriomphe, Notre Dame)• Cape Town: The Mother City (Enjoy TableMountain, Sunsets)• More Than Starlets: Visit West Hollywood(Chefs, Bikes, Food, Design, Family, Dogeball)• Visit Houston(Visit NASA, Car Parade, Grafitti Wall Art)• Sail The Seas (VisitCroatia, Alaska, Mediterranean Sea)About You|Visit:YouVisit is aleading Virtual Reality technology company. 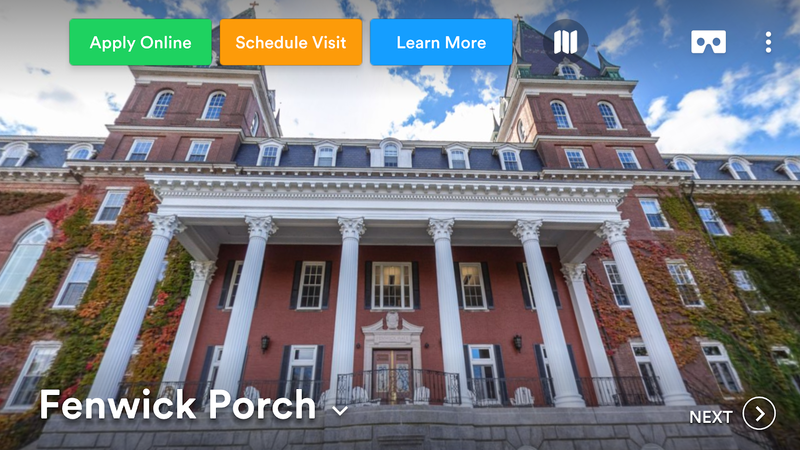 Using a proprietaryservice platform, YouVisit leverages the immersive power ofinteractive VR to spark curiosity, inspire exploration, and gobeyond the boundaries of what is possible. Punjab Group of Colleges “The Largest Educational Network inPakistan” strongly believes in revealing world-class education tothe potential intellectuals. The chief objective of establishingPGC app is to stand with the revolutionized world where theinnovation in technology has all the dilemmas sorted for students.The app is designed to reveal just in time information, relevantcourse-based material for swift learning and necessaryadministrative updates. PGC App provides every individual with anAll-In-One Solution. The App facilitates the learning fanatics withthe major features related to 1. Campus Network: Puts forward theinformation of 390 campuses in 111 cities 2. Programme: It exposesyou to the programs offered in different cities/campuses 3.Admissions: Gives you the information on admissions andscholarships 4. News & Events: Updates you on all thehappenings at various PGC campuses 5. Profile: Provides you withall the important and personal information 6. Time Table: Informsyou with the weekly schedule of classes 7. Attendance: Keep trackrecord of your attendance 8. Fee: Keeps you posted on the programfee and its submission 9. Result: An overview of your test and examperformances instantly 10. EL by PGC: Enhance your way of learningwhile making it handy Striving for an ideal future of its students,Punjab Group of Colleges gives access to world-class education forthe learning fanatics. The main objective of including E-Learningin this app was to make learning handy and at your fingertips. Byallowing the app to be a part of your learning journey every day,you bear the capacity of sitting back home and upgrade yourknowledge without wasting your time. Lamenting the fact, the app isdefinitely ‘A Better Solution Than Tuition.” - The app offershundreds of syllabus related MCQs which will benefit you to prepareand practice for the exam. Learning through this feature becomessimple and increases your overall performance. All this issupported by Practice Keypad & Results. - Permits the user toenhance their skills and intellect by thoroughly going throughVideo Lectures. - Allows the user to prepare for the exams bydirectly accessing All Intermediate Boards Past Papers of last 5years on the app for effective learning. This app will provide youwith an edge to excel in the world of learning, sharing knowledgeand producing great results. TurningPoint app allows you to use your web-enabled device torespond to questions in real time and self-paced modes.TurningPoint is proven to increase retention and engage learnerswhile allowing instructors to collect data to ensure comprehension.A variety of subscription options are available. FEATURES &FUNCTIONS: • Questions and response options are displayed on yourdevice when polling is opened so that you can answer in real timeor at your own pace during self-paced assessments. • Screendisplays group response, user response and indicates correct answerwhen polling is closed • Multiple choice, multiple response,numeric response, true/false and short answer, open-ended questiontypes available • Ability to send messages to communicate questionsor concerns • Navigate through self-paced assessments in variousways: swiping, navigation carousel, question list view • Ability tosend messages to communicate questions or concerns NOTE:TurningPoint app is compatible with Android OS 5.0 and above. Usersparticipating in sessions with previous OS versions can participateusing a web browser by visiting ttpoll.com. Tyler SIS Student 360 is the parent and student portal app to viewschool progress and activities in school districts that use TylerSIS. If your school district does not use Tyler SIS, you will notbe able to use Student 360. When you first install Tyler SISStudent 360, you will search for your district by name or by ZIPcode. After selecting your school district, you may receive amessage saying your district has not yet enabled Student 360. Ifthat is the case, you will need to wait until your district enablesStudent 360 and announces it is ready for use. When you log in, asummary screen shows important information at a glance. Inaddition, you can view... - Announcements - Assignments - quicklyview upcoming or missing assignments and see scores - Attendance -by date or by class. - Course Schedule - Report Card Grades ...andmore. NOTE: The options available depend on which features yourdistrict has chosen to enable. Skyward Mobile Access provides intuitive access for students,parents, and school staff that currently use Skyward’s FamilyAccess, Student Access, Educator Access, or Employee Access.Skyward Mobile Access will automatically locate your district andtake you instantly to your vital information such as grades,attendance, discipline, payroll, time off, and more! Please contactyour school district with questions, comments or concerns about theapp. Note: Your school district must activate Skyward Mobile AccessAutomatic Setup in order for this application to locate your schooldistrict and connect to it. myU app saves teachers’ time, effort and the day-to-day hustle andbustle of communicating with students by powering them with a freesimple tool for them and their students to connect and share on thego. Use myU to: * Send class announcements and reminders * Manageattendance and receive reports * Organize your classes in oneplace. * See who viewed your message and who missed it * Sharetext, photos, voice notes and links. * Upload documents in thefollowing formats: PDF, Word, Excel, PPT * Chat one on one withyour students myU offers a standard 100MB of document upload space.An upgrade to myU Prime is available for teachers where users willbe provided with an additional 100GB of document upload space, thecreation of 4 extra boards, the ability to upload up to 8 images ata time, and to record video and voice notes up to 2 minutes long.Students can upgrade their accounts to know if their privatemessages were seen by other users. Users can subscribed for a 1month free trial, after which they will be auto-billed monthly.After any subscription has been stopped, users will have the optionto renew their subscription on a monthly, or annual basis.Subscriptions are auto-renewed when expired. Users can turn offauto-renewal at any time from iTunes account settings at least 24hours prior to the end of the billing period.